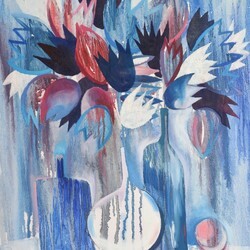 Original artwork, decorative painting blue still life with flowers. Oil on canvas 19.5 x 23.5 in (50x60cm), Amsterdam 2015. Created by Olga Milovich - professional puppet theatre designer based in Amsterdam (from St. Petersburg Theatre Arts Academy, Russia).